Following the success of the Talk and Special Edition Wraps wristband earphones ranges, the company is now launching a new version, Wraps Limited Edition Berry, to celebrate the festive Christmas season. Based on the Talk Wraps but with a striped pink design to bring this look to life, you can now listen to your Christmas songs whilst adding a festive touch to your look! Reminiscent of a candy cane and the traditional Christmas berries, they are sure to get you in the party mood. 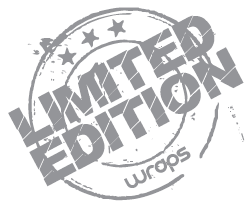 Perfect for treating yourself or an excellent gift or stocking filler – the new Wraps Limited Edition Berry will be available for a short time only so get yours whilst you still can! 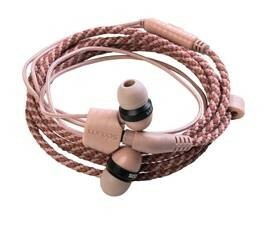 Using Wraps earphones has fast become as much about how good you look wearing them as it is how good they sound. Not only do the earphones look and sound great, they also solve the daily frustration of those that are easily broken, tangled or lost. 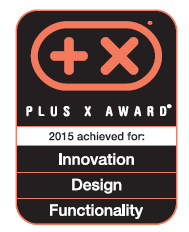 Wraps solve 3 inherent problems all earphones have: storage, anti- tangle and style simply by enabling you to wear them on your wrist whilst you’re not using them. #WearYourSound with pride and bring your outfit to life while also having your favourite music ‘on hand’ whenever you want it. The Wraps Limited Edition Berry feature a built-in headset microphone and 3.5mm gold plated jack and a light, spherical ABS housing helps control the sound. With a choice of small, medium and large silicon tips it provides a comfortable and secure fit whilst worn in the ear or on a wrist. A large 10MM dynamic speaker, tuned by world-renowned British Audio sound engineers, delivers exceptional sound quality. When worn on the wrist, the unique patented slider system keeps the lightweight heads, slider and jack plug all connected together for a secure compact fit. 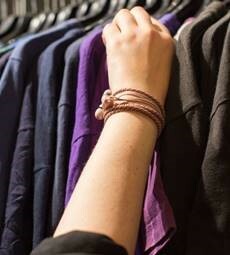 The cables are kept in perfect alignment and remain tangle free and always close to hand! The British designers blended materials and colours to craft a fashion statement earphone that can stylise your outfit and coordinate your look so whether travelling to work, to a Christmas party or heading off to school, there is a Wraps earphone for you!